This Field Guide for the boat, truck, kayak or tying bench is designed to help those who pursue Big Bass fly fishing on topwater. John Lindsey, fly fishing and tying expert, and an International Fly Fishing Association (IGFA) world record holder since 2000, shares four generations of tips, secrets, funny stories and family jokes. Lindsey outlines the details that not only catch small and medium-sized bass, but also those hard-to-catch bass four to five pounds and larger. His numerous tricks, techniques and ideas work on both heavily-fished public water and rarely-fished private water bodies. After reading his book, topwater bass fly fishermen won't have to wish each other "Good Luck," when "Good Preparation" will be more appropriate! An avid fly fisherman and tier since boyhood in Arkansas, John Lindsey has fished in numerous states in the South, Southwest, East Coast, Pacific Northwest and Alaska. In fact, his teenage fly tying partially funded his college career! Lindsey worked in the computer industry before retiring, and then he and his wife Renetta followed their children and grandchildren to the Pacific Northwest. Today he is a speaker and fly tier at schools, clubs and public events. 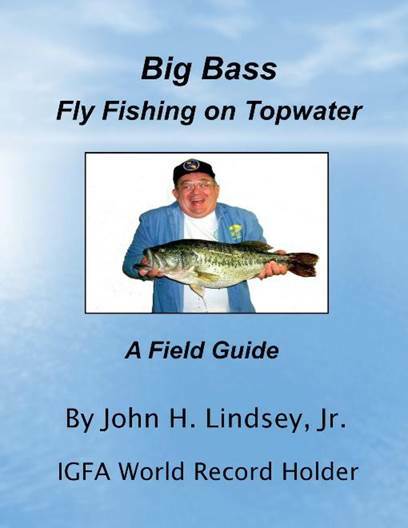 More information about his book, bugs, tools and accessories are on John Lindsey's website, www.bigbassflyfishing.com. Over the years many, many people helped me learn how to catch Big Bass–and this Field Guide is my attempt to pass on to others the proven strategies that catch more and Bigger Bass. The book targets the more accomplished fly fisherman who already knows how to cast and has already caught largemouth bass on a fly rod. I've included "on the water" pictures with numbers showing the best to worst places to cast using "in the box" and "out of the box" techniques. Except for Big Bass Bugs, which are a major part of topwater Big Bass fly fishing, I've tried to cover everything else in depth for the non-beginner. This detailed preparedness will let less Big Bass get away. And when they do, and they will, you'll be better prepared to fix the problem next time and catch them! Price $29.95, 189 pages: 8 ½" x 11"